While taking blood pressure medications and managing chronic diseases can lower stroke risk, certain foods may also play an important role. Always check with the physician before introducing new foods into your senior loved one’s daily meal plans. Here are some healthy foods that may lower your loved one’s risk for stroke. Salmon and other types of fatty fish such as tuna and mackerel are rich in omega-3 fatty acids. These substances decrease platelet aggregation, making it less likely that stroke-causing blood clots will form. Salmon may also reduce systemic inflammation, which may be a risk factor in the development of heart attacks and strokes. Although fatty fish can lower stroke risk, consuming large amounts of it, especially when combined with aspirin or prescription anticoagulants, may heighten the risk for abnormal bleeding. Always check with the physician before increasing your loved one’s intake of fatty fish. For many seniors, shopping for fresh foods and preparing nutritious meals on their own can be challenging. Aging adults who require assistance with the tasks of daily living can benefit from reliable elder care. Richardson, TX, families trust Home Care Assistance to provide the high-quality care their elderly loved ones need and deserve. Our caregivers are trained to help seniors prevent and manage serious illnesses and encourage them to make healthier decisions as they age. Almonds are good sources of magnesium, which has been shown to lower blood pressure and regulate the heart rate. Higher intake of magnesium is thought to play an important role in stroke reduction. Magnesium may also keep the kidneys healthy while maintaining healthy blood glucose levels in diabetics. Kidney disease and diabetes may raise the risk for stroke and heart disease, especially in seniors and those with other medical conditions such as arteriosclerosis. Consuming more potassium-rich foods such as bananas may significantly reduce stroke risk. Potassium enhances cardiovascular health and lowers high blood pressure. Foods high in potassium may also help the kidneys work better so the body can eliminate toxic waste products and keep edema at bay. Eating bananas can diminish cardiac arrhythmia risk, another potential risk factor in heart attacks and strokes. Some seniors have mobility limitations or health conditions that make it difficult to prepare nutritious meals on their own. Every senior has different needs when aging in place. Some simply need occasional assistance with household chores, while others may be managing a serious illness and require more extensive live-in care. Richardson seniors can count on Home Care Assistance to provide the in-home care they need and deserve. Oranges, grapefruit, and other citrus fruits may decrease the risk for stroke. Rich in vitamin C and flavonoids, citrus fruits can lower the risk for arterial inflammation, blood clots, and high blood pressure. Diets rich in citrus may also reduce total cholesterol levels while raising levels of high-density lipoproteins, also known as “good cholesterol.” While citrus fruits may reduce the risk for stroke, they can cause digestive issues in certain people. Citrus fruit can cause diarrhea and may worsen the symptoms of acid reflux disease. Rich in antioxidants and flavonoids, dark chocolate may decrease arterial inflammation and lower the risk for hypertension. It may also raise “good cholesterol” while lowering low-density lipoproteins, or “bad cholesterol.” High levels of low-density lipoproteins may be associated with a higher risk for strokes and heart attacks. 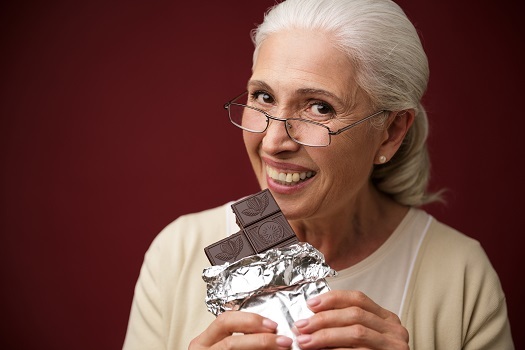 While consuming dark chocolate in moderation may be a healthy addition to your loved one’s diet, eating too much could lead to obesity and higher blood glucose levels. Some aging adults may need help making lifestyle adjustments that include eating healthy foods to reduce the risk of stroke and other cardiac issues. In Richardson, elderly home care agencies can be a great boon to seniors. With the help of the caregivers at Home Care Assistance, your aging loved one can lead a happier and healthier life. We offer a revolutionary program called the Balanced Care Method, which encourages seniors to eat nutritious foods, exercise and socialize regularly, and focus on other lifestyle factors that increase life expectancy. Home Care Assistance can be your trusted partner when your loved one needs help with the challenges of aging. Call us today at (469) 573-4213 to learn about our high-quality in-home care services.